A MOTORCYCLE AND CLASSIC CAR FUN RUN. Registration & Breakfast begins at 9 a.m. at Harley-Davidson of Mason City. Pick up your route map, t-shirt and hit the road through several Northern Iowa stops. 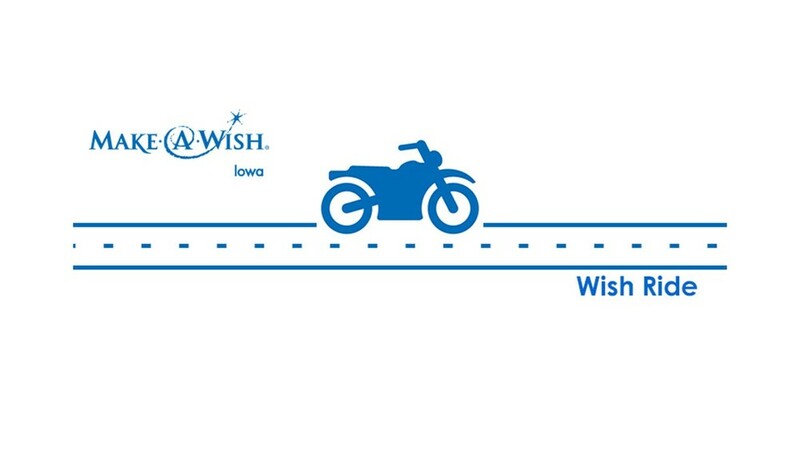 Ride begins at 10:30 a.m.
Ride finishes at The Other Place in Clear Lake for live music and a chance to win $500 - all to benefit Make-A-Wish Iowa. All Riders must turn in their Wish Ride card at The Other Place in Clear Lake by 4:30 p.m. to qualify their card hand for the $500 prize money. Registration fee includes T-shirt, breakfast courtesy of Harley Davidson, a beautiful ride through Northern Iowa, and a Wish Ride poker card for a chance to win $500. Route information will be posted on our FACEBOOK page. For more information, visit iowa.wish.org or contact Lena Marshall at lmarshall@iowa.wish.org, (800) 797-WISH. Every 35 minutes Make-A-Wish® grants the wish of a child diagnosed with a life-threatening medical condition in the United States and its territories. We believe that a wish experience can be a game-changer. This one belief guides us in everything we do. It inspires us to grant wishes that change the lives of the kids we serve. A wish is granted every other day in the state of Iowa. Learn how Make-A-Wish® Iowa is serving the local community.